Between 1840 and 1914, more than 40 million immigrants came to the United States. Many immigrants came to America seeking greater economic opportunity. Some fled famine, war, or political problems in their home countries. Historian Dirk Hoerder identified two categories of immigrants who came to the United States: settlers and workers. American society usually welcomed settlers. This was especially true in western states that wanted more people in order to build their population and farm the land. In fact, many of these states encouraged these settlers to participate in politics, including voting. Between 1848 and 1859, seven western and midwestern states (Wisconsin, Minnesota, Michigan, Indiana, Oregon, Kansas and Washington territory) passed laws that gave foreign-born men who said they intended to become citizens the right to vote. By 1900, about half the states had given non-citizens voting rights at some point, though all states revoked that right by 1926. The other immigrant group was “workers.” Unlike settlers, they did not have money to buy farmland, or skills and capital to establish businesses. Some were from Ireland, displaced by the terrible famine in their home country. Others, like the southern and eastern Europeans who migrated to the U.S. east coast and people who migrated to the west coast from Eastern Asia and the Pacific Islands, sought economic and social opportunity. Workers were more likely to settle in cities, where they usually took jobs in construction, manufacturing or transportation. Although there was some sympathy for immigrants fleeing famine or war, most established Americans viewed these working-class immigrants with suspicion. They were looked at differently from and by the white, Anglo-Saxon Protestants who held social and political power. Workers were more likely to be Catholic or Jewish, rather than Protestant. 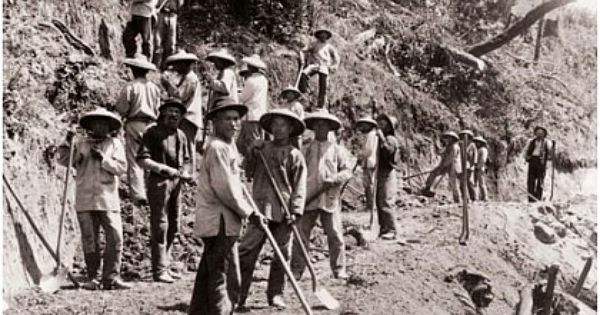 Workers from Asia had beliefs and cultural practices that were not understood or appreciated by American society. Working-class, native-born Americans feared losing their jobs to lower-paid immigrants. Workers were usually treated poorly in comparison to how settlers were treated. Discrimination against the new working-class immigrants by race, nationality and religion was common in employment, housing and politics.